A major announcement on Thursday confirmed that a further 24 billion euro will be handed to the ailing banks in the 26 County state, but that the bondholders in the banks -- those funds which provided the capital for Ireland’s credit boom -- would be repaid in full. Following ‘stress tests’ on the state of the banks, the Fine Gael/Labour Party government agreed to pour more than three-quarters of the 26-County state’s annual tax take into the banks. 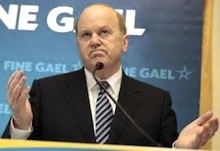 Despite fully backing the policies of the disgraced previous Fianna Fail government, Finance Minister Michael Noonan denied lying to voters during the 26-County general election campaign. “We have not broken our word,” Minister Noonan said. He argued that his party’s [Fine Gael’s] election promises were conditional on agreement being reached at European level, which they had failed to secure. Since the collapse in 2008, the cost of bailing out the banking system has now reached 70 billion euro -- not incuding the unrealised cost of NAMA, the state ‘bad bank’ set up to isolate bank losses in late 2009. “We want burden-sharing but we would not do it unilaterally. We would only do it with the agreement of Frankfurt and we did not get it,” he declared. Noonan said the ECB, which is now lending the 26-County State with the necessary funds at a punitive rate, had been emphatic that these bondholders must continue to be paid off. He said the ECB had been “very good to Ireland”, providing almost 200 billion euro in loans. He also added that the government was leaving open its position in relation to Anglo Irish Bank, which has been written off as a going concern. But he agreed the Dublin government would not be pushing for renegotiation of any debt. “The debate is over. Frankfurt would not agree,” he declared. This week, he and his officials are to finally ask the ECB to lower the interest rate being charged for the bailout funds. Expectations are low that he will obtain any significant reduction. Sinn Fein President Gerry Adams accused the coalition government of pursuing the same “failed” policies that saw the former administration hounded out of office. He said the government was making ordinary citizens bear the burden of the debt. “Rather than go after over 20 billion euro in unguaranteed bonds, the Government is making ordinary citizens bear the burden of this debt. He also in the Dail demanded that the Government stand up to the EU/IMF and honour its commitment on reversing the cut to the minimum wage. Mr Adams remarks follow an admission by Fine Gael leader and Taoiseach, Enda Kenny, that any change to the minimum wage required the approval of the EU/IMF. He pointed to the example of five workers in the Davenport Hotel in Dublin who had their wages lowered without their consent. The ensuing dispute went to the Labour Court, which found in favour of the workers. “This happened because the previous government cut the minimum wage, which sent the signal to employers that they could do what they wanted on wages. “This is an outrageous and unacceptable situation. It is an admission by the Taoiseach that the Government is bound by EU-IMF diktat regardless of the consequences on the people.